It's coming. The legendary Stock Aitken Waterman songwriting and production team, the phenomenal success of Pete Waterman’s PWL label and, above all, the irresistible pop that came to define an era in British music history. LIVE! 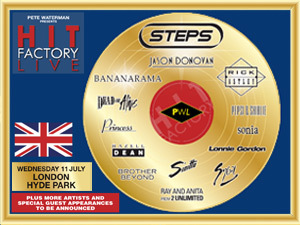 In London's Hyde Park on 11th July there will be: Steps, Jason Donovan, Sinitta, Sonia, Ricky Astley, Bananarama, Pepsi and Shirlie, Brother Beyond, Dead or Alive, Princess, Hazell Dean, Sybil, Lonnie Gordon, 2 Unlimited.